In response to Wifely Steps entry, Notebook in my Bag, I also carry a notebook in my bag. Nothing beats having a notebook and pen in hand when a great idea comes to mind. 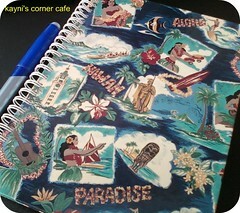 I bought this notebook in Hawaii when I went home to celebrate my 31st birthday. I love the Hawaiian themed cover because it reminds me that I'm carrying a piece of aloha with me wherever I go. It also makes me feel close to home all the time. If I were to allow you to peek into my notebook, you'll see a hodgepodge of thoughts from what I'm feeling about work and life, weekend must-dos, shopping lists, recipes I'd like to try, blog ideas, my top ten world destinations (which seems to change every month), to what I'd like to eat for dinner. I also paste my favorite funny comic strips and cut out sweet notes from family and friends which I revisit when I am feeling low. This notebook isn't just an absorber of my stress and crazy moments, but also a source of laughter and encouragement. Sometimes, when I'm so stressed at work, I usually get away from my computer and write on my notebook to relieve the stress. It helps me refocus and get back into working mode. This notebook is half-way full, so I might start looking for a new notebook soon. How about you? Do you carry a notebook too? I carry a post it (large) to jot down my thoughts. I don't have much room for a notebook in my bag/purse. i do!!! i love notebooks! Now that I am engaged, I've been carrying a notebook to jot down ideas and inspiration for my wedding next year. It's not an organized notebook, not in the least, but it does help! I will post it in my blog. i do too :) a small notebook..i like paper! any kind.. i think all my notebooks have the first pages used till i move to the next one..
i journal a lot, i found it the most practical and easiest anti-stress therapy.. i've got piles of notebooks from the past years.. Enjoy the new week Kayni. I carry around a notebook, too. Just a small Moleskine. i really should. i keep a notebook-style journal, though..which is always at home. Kayni, what an excellent idea!! I currently don't have anything like what you have, though a good friend of mine did give me something I could use.